The Immigration Minister has confirmed that UK Border Force “would not ordinarily object” to the development of so-called ‘hangar homes’ on aerodrome sites, in a letter to the All-Party Parliamentary Group (APPG) on General Aviation. Housing built airside on working airfields is common-place in parts of the world, including the USA and some European countries. Such hangar homes can be used as part of an industrial complex, for air transport or to provide an on-site presence for security purposes; in addition to sporting, leisure and lifestyle purposes. There have been Local Planning Authority questions raised about whether such development would be acceptable to UK Border Force. 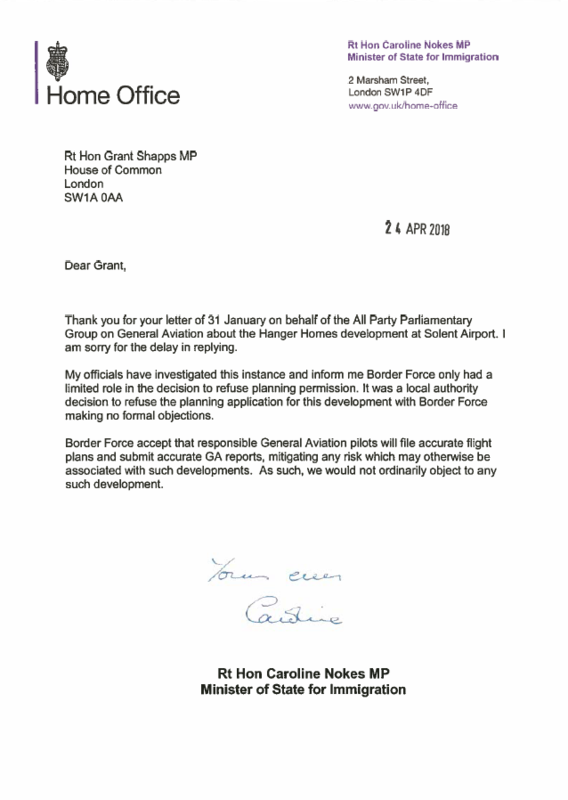 However, in a new letter to the All-Party Parliamentary Group (APPG) on General Aviation from the Rt Hon Caroline Nokes MP, the Immigration Minister confirms that “Border Force accept that responsible General Aviation pilots will file accurate flight plans and submit accurate GA reports, mitigating any risk which may otherwise be associated with such developments”. Welcoming this significant letter, Chair of the parliamentary group the Rt Hon Grant Shapps MP said: “This is the first time that an Immigration Minister has confirmed that the UK can catch-up with other parts of the world by developing housing to help facilitate the operation of an airfield. General Aviation already provides more than 38,000 high-skilled jobs and contributes £3bn directly to UK plc, but this is just the tip of what becomes possible with a more vibrant approach to General Aviation. The All-Party Parliamentary Group on General Aviation has 150 parliamentary members from across both Houses of Parliament, and all the major political parties. The full membership can be found at www.GeneralAviationAPPG.uk/parliamentary-members. The full letter from the Immigration Minister can be read below.